I'm completely beat after having attended Stockholm's annual food fair, which I'll tell you about tomorrow! Here's a quick weeknight dinner, perfect for when you don't have a lot of time to cook. You need fresh tortellini - or any fresh pasta really - which I imagine you'd find in most supermarkets. The recipe originates from the Swedish superstar chef Mathias Dahlgren, who has pancetta in his version, and bakes the chicken in the oven, but I found this plenty salty and savory just the way it was. Cut a few deep scores in the chicken breast, and add the sage leaves. Season with salt and pepper. Brown in butter, and pan-fry on medium heat until just cooked through. Fry the mushrooms in butter. Melt the two tablespoons of butter, and add the garlic. Don't let it brown, but cook on low-medium heat for a minute. 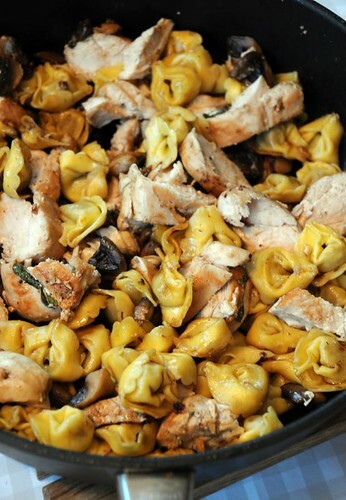 Cook the tortellini according to package instructions, and toss with the garlic butter. Add the mushrooms. Slice the chicken, and add that, too. Two of my favorites combined together! This is absolutely delicious! I bet I'll drool while cooking this dish! LOL! And it's easy too!